Doors to Homes and Hope opens for the second year Saturday, October 4, 2014. 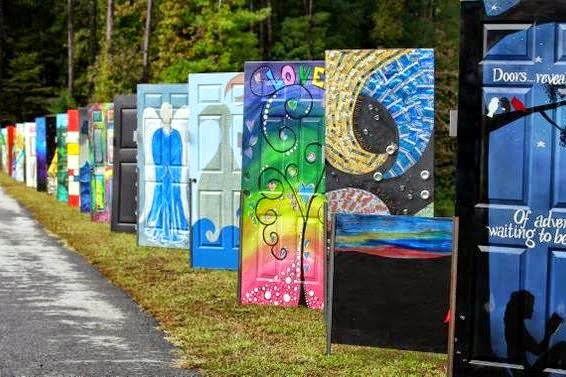 Artistic doors will be exhibited outside in public spaces through November 1, 2014 in Gwinnett County. Over 140 local artists painted beautiful Doors of Art in support of Gwinnett Habitat for Humanity and Artworks! Gwinnett. The Doors of Art can be viewed and purchased online at www.gwinnetthabitat.org beginning October 4th with proceeds shared between the two organizations. What began as an art event in 2013 has quickly became an unprecedented art movement bringing together the private, public and non-profit sectors of the Gwinnett community. Exhibiting cities, Norcross, Suwanee, Duluth, Sugar Hill and Lawrenceville, will join presenting sponsors, Lowe's and Two Men and a Truck along with Gwinnett Technical College, Gwinnett Great Days of Service, The Tool Bank, several art organizations, supporters and Gwinnett County schools to bring awareness of the need for affordable housing to create a better Gwinnett. Addresses poverty housing by building decent, affordable homes for families in our community. Gwinnett ReStore is the retail division of Habitat where donated home furnishings and home building materials are sold to the general public. Proceeds support the Habitat for Humanity mission.